There are so many products in the market today that are designed to reduce the appearance of dark circles under the eyes. But these products contain chemicals that may cause harm to your delicate skin. Added to that are most of them are so expensive. So, why not go and try some home remedies? Not only that, the natural remedies below can be done in only 15 minutes! 1. Pour hot water over 2 tea bags and steep for 5 minutes. Then remove the tea bags and put in the freezer. 2. When the tea bags are very cold, place them on your eyes. Hold this position for at least 15 minutes. 3. Rinse your eyes with cold water and pat them dry. 1. Refrigerate a large cucumber until it is cold. Then cut them into 1⁄/2 inch slices. 2. While lying with your head back, place one cucumber slices over each of your eyes. Leave this for at least 15 minutes. 1. Crush some mint leaves into a paste, then add juice extract from half of the lemon. 2. 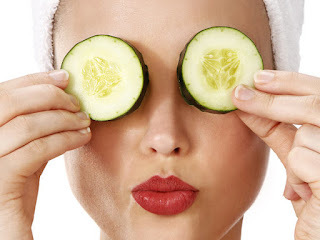 Apply the mixture into the area under your eyes. Leave this on for 15 minutes.